With less than two months until Houston takes the stage as the 51st host to the Super Bowl, Avenida Houston developments are almost complete from the outside. With most of the current work happening on the inside of the Marriott Marquis and the George R. Brown Convention Center, the exterior now holds two new signs for soon-to-open restaurants. Recently, Biggio’s Sports Bar erected its sign over the second-level balcony, overlooking Avenida Plaza and Discovery Green. The bar named after Houston Astros Hall-of-Famer Craig Biggio will offer televisions for every sports fan’s delight, along with local craft beer, beverages and food. This week ended with the lifting of the Xochi sign, on the Walker St. - Crawford intersection of the Marriott Marquis. Located on the ground floor, this new concept is one of executive chef Hugo Ortega, who is well-known in the Houston community and the nation. Teamed with pastry chef Ruben Ortega and beverage director Sean Beck, Xochi will offer a high-quality experience for Avenida guests. 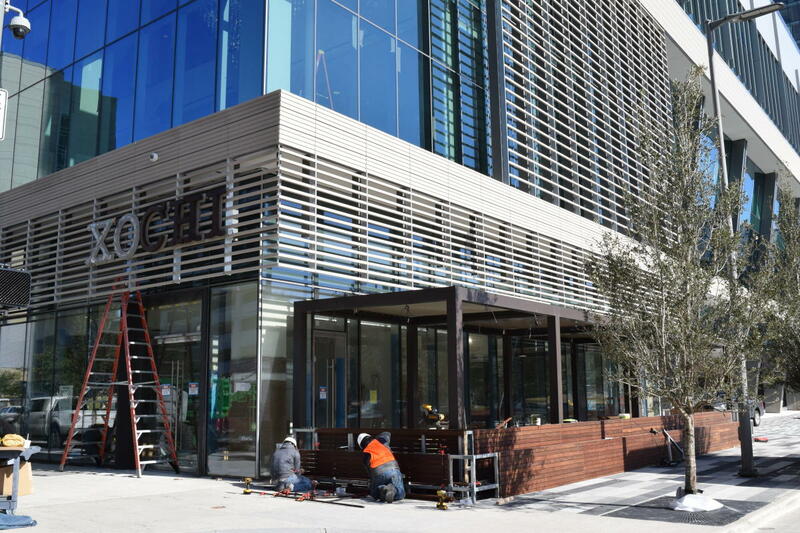 With Walker Street Kitchen and Biggio’s slated to open later this month, the excitement is growing in Avenida Houston. To learn more about what food you can and will find in Avenida Houston, click here.